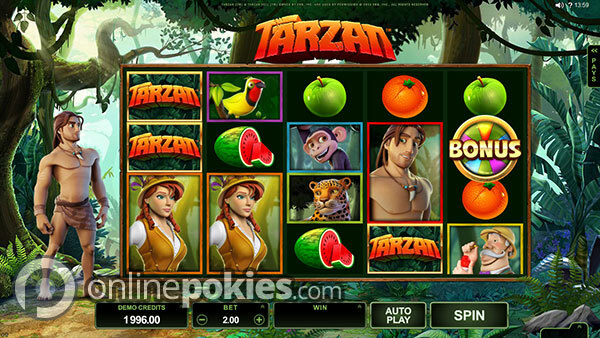 Tarzan is a 40 line Microgaming poker machine that features a bonus wheel feature where you can win free spins, a pick and win bonus or a jackpot. It also offers stacked wilds and a big 1,100,000 credit jackpot. The fictional Tarzan character has existed since 1912 and has been the source of many movies, books, comics, video games and even several pokies. 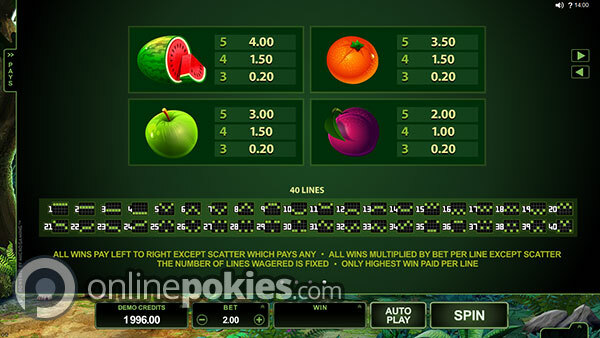 Microgaming have released the first official online pokie based on the classic character so you can now escape to the jungle at any time. With 40 paylines the minimum bet on all lines is 40 cents. You can select from credit levels ranging from 1c to 10c and have the option of betting up to 10 credits per line which gives a max bet per spin of $40. The Tarzan logos are wild and appear in stacks on all reels. Getting five of a kind on a single line pays 8,000 credits. 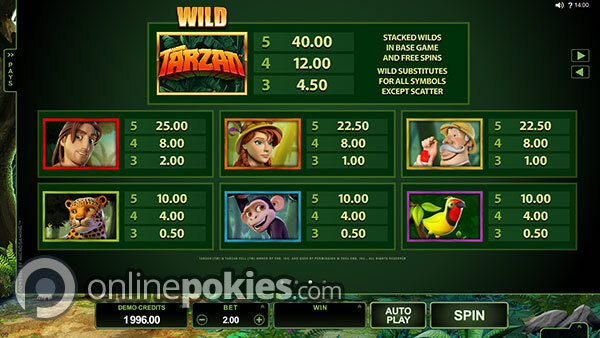 It's possible to get a whole screen of wilds which pays the top jackpot on all 40 lines and awards a swing through the trees jackpot of 320,000 credits. To trigger the feature you need to get three, four or five of the scattered Bonus symbols. This awards one spin of the bonus wheel where you can win the following prizes. 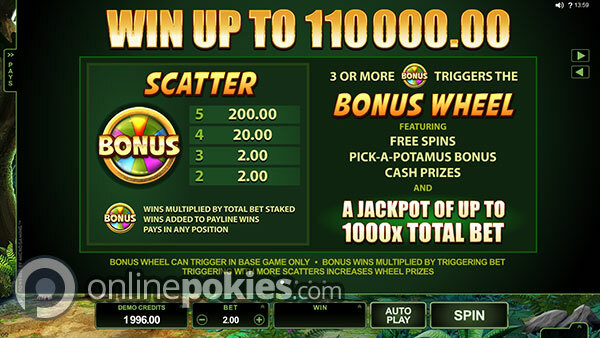 The Bonus wheel feature can be a bit disappointing especially if you take a long time to trigger the feature and then win a small multiplier. The Multiplier and Jackpot wins are self explanatory. 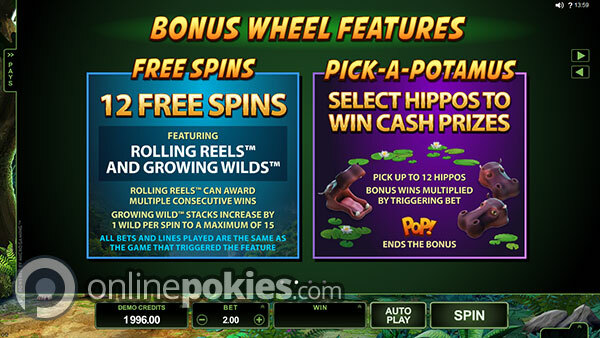 Trigger the free spins and you get 12 free games with Rolling Reels and Growing Wilds. The Rolling Reels offer a cascading wins feature where wins are paid and then new symbols drop down. The Growing Wilds feature adds one wild to each stack up to a maximum of 15 wilds per stack. Trigger the Pick A Potamus Bonus and you then move to a pick and win stage where you select Hippos to win prizes based on your total bet. You get to keep picking until you uncover the Pop symbol.